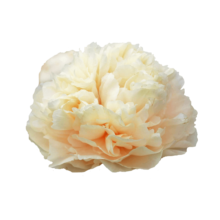 Paeonia Pastelegance is a cross between Lemon Chiffon and Salmon Dream. She combines the best qualities of both peony varieties. The salmon colour of Salmon Dream and the pastel cream of Lemon Chiffon are both visible in the flowers of Pastelegance and are locked in a battle for dominance. One thing is for certain: Pastelegance is never boring! Paeonia Pastelegance is a semi-double hybrid that stands out from the crowd because of its colours. Salmon, pastel peach and cream are all present. Just like its famous parents, this variety has thick stems and large buds. The flowers can reach a diameter of up to 20 cm! Pastelegance was bred by famous American breeder Bill Seidl, who registered the variety in 1989. In matter of fact it’s his most popular creation! This says a lot about the extravagant beauty of Pastelegance, considering he also bred the very popular Pink Vanguard and Carnation Bouquet. For the time being, Pastelegance is a very exclusive peony variety. We only have a very small quantity available on special order. We expect to have them growing in larger quantities by 2021, so no one will have to miss out on the elegant Pastelegance.